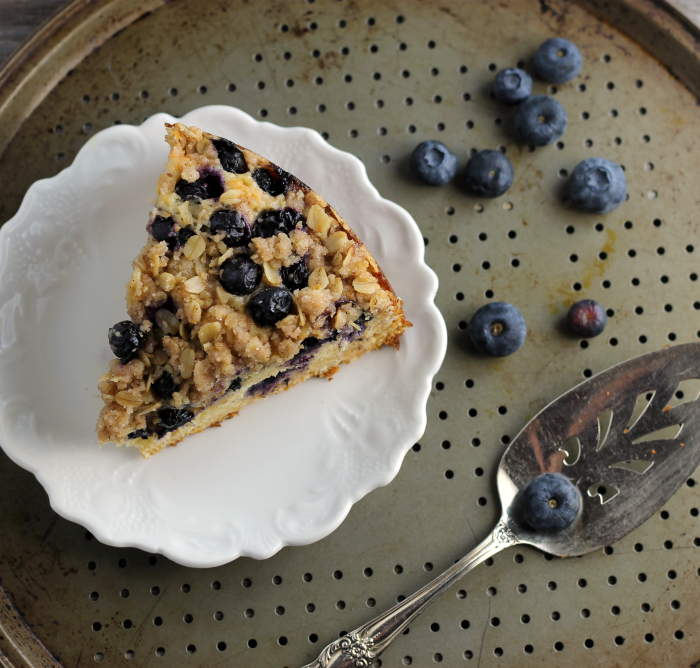 Blueberry honey oat breakfast cake, I love starting my day with a slice of this cake. This cake has so many ingredients that I love. 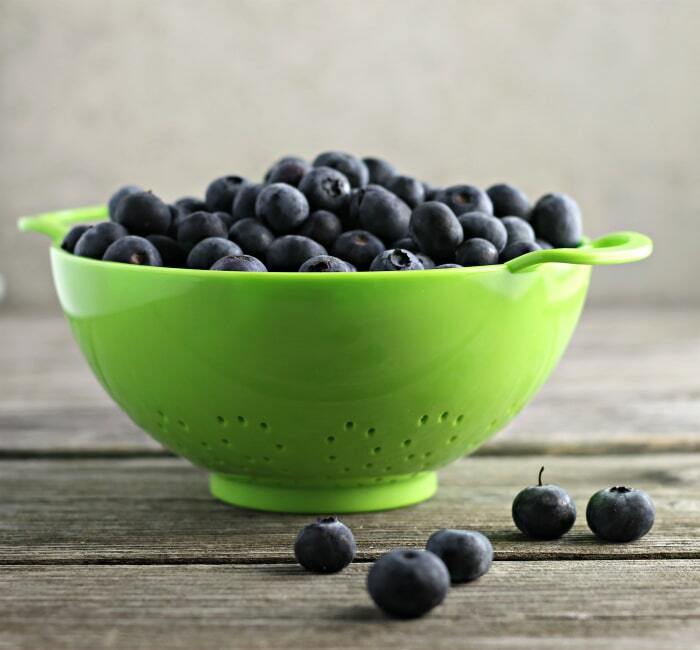 Blueberries are one of my favorite berries in the summer time. This summer they have been exceptional. It had to be a bumper crop this summer. They have been plentiful in the stores and really cheap. Tons of these yummy berries have found their way into my house this season. I will have to admit that I will miss them when the season ends. I remember as a kid my mom and one of my brothers would go to northern Minnesota for about a week with my aunt and uncle and they would pick wild blueberries. They would come home with tons of fresh blueberries that we would freeze for the winter months. But some of the fresh berries were always saved for blueberry pie. Still one of my favorite pies today. I love memories such as this one. And maybe this why I love blueberries as much as I do. Ok, now for this blueberry honey oat breakfast cake. Yeah, it took a few tries before I got it to the point that I was satisfied with the final result. You know, although I made it several times in a matter of a couple of weeks, I really don’t think anyone really got tired of eating it. 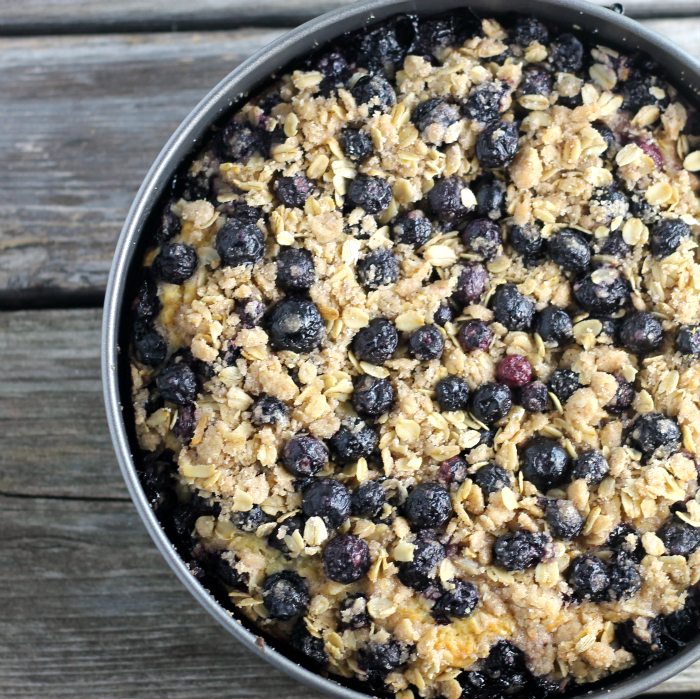 The blueberry honey oat breakfast cake has a hint of honey in it, which is always a good thing. But the thing I love the most about this cake is the crumble. Yep, the crumble, I believe this type of cake usually comes down to the crumble. As for this one, the blueberries are mixed into the crumble. A good amount of the crumble is swirled into the cake, with the remaining crumble left to garnish the top. With swirling a part of the crumble into the cake you are getting some of the oats and blueberry down into the cake, adding more flavor to the cake. 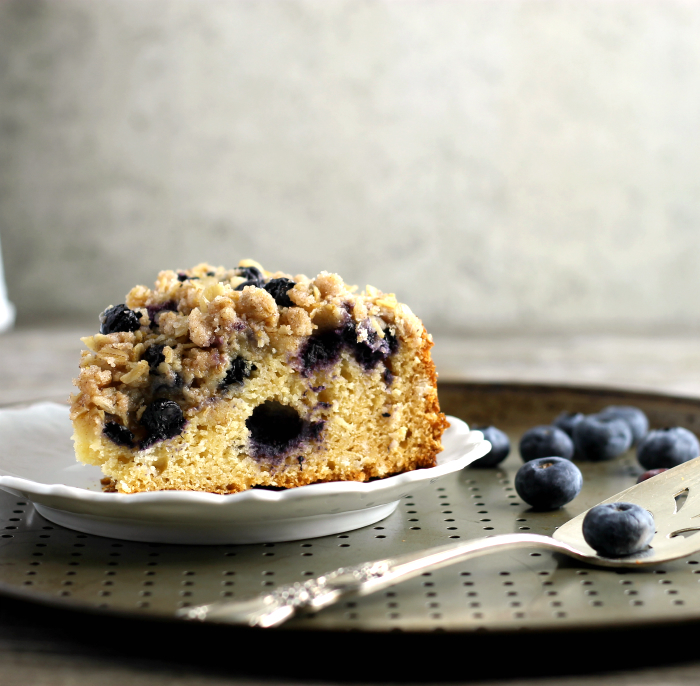 This cake is called blueberry honey oat breakfast cake, but please don’t let that stop you from eating at different times of the day, although it is a delicious way to start your day. Preheat oven to 325 degrees F. Grease a 9-inch springform. In a medium bowl mix together the flour, baking powder, salt, and sugar. Cut in the butter until the mixture resembles breadcrumbs. Mix the eggs, honey, and yogurt together and add to the dry ingredients. Mix just until ingredients are combined. Spread the mixture into the prepared springform pan and set aside. In another medium bowl combine the sugar, cinnamon, flour, and old fashion oats. Add the butter and mix until the ingredients are combined. Toss in the blueberries. Reserve a cup of the crumble for the top of the cake. Sprinkle the remaining crumble over top of the cake. Take a knife and swirl the crumble into the cake. Top with the remaining crumble. Place the cake into the preheated oven and bake for 45 to 50 minutes or until a toothpick insert comes out clean. Remove from the oven and cool on wire rack. Look amazing and delicious like always !!! We too love blueberries. This is an amazing breakfast cake, Dawn. I love a good crumble as well. Something so wonderful about it. So many good things here! First of all, cake for breakfast. Secondly, blueberries! I have a secret blueberry patch that I visit every summer. Out of that comes my annual blueberry pie. (We’re on track to do that sometime next week or the week after.) After that, it’s everything blueberry – blueberry butter, muffins … you name it. I think this year, though, it’s going to be blueberry breakfast cake, because it looks so wonderful! This cake looks delicious – moist and I love the topping. Blueberries are one of my favorite summer treats. I love blueberries. This cake looks so gorgeous and delicious! What a marvelous summer treat! I have blueberries in the fridge, but not quite enough to make this yummy cake. Maybe a treat for my knitting group next week! This looks amazing, Dawn! We eat oats quite often in granola form around here…but I’m thinking I need to make this oat cake sometime soon. Oats in crumbles are just awesome because they get nice and toasted and crispy. Yum! And then you add in those fresh blueberries. I definitely need a slice of this one right now with my morning mug of coffee. Sounds delicious! !